If you were going to put a saying on the side of a coffee mug, what would you say? I wasn’t so sure. We discussed that at length during a recent team meeting. We had a little momentum around this one. It was a mantra that served us well for a long, long time. And it’s tough to beat for pure morning coffee inspiration. Just like that, we had a winner. The next challenge: Finding the mug worthy of inserting into the morning routine. Turns out that problem was solved a few miles from my home with one quick field trip to tour the incredible Deneen Pottery manufacturing facility in Saint Paul’s Midway Creative Zone. There is no question that my Bulletproof coffee tastes better out of our new handcrafted, custom-made signature mug. I also knew the Deneen story was one I simply had to share with you. Old world craftsmanship is becoming a lost art. It is the foundation that Deneen Pottery was built upon and what still differentiates them today. Niles Deneen is president of the family business, which his parents started in their garage in Minneapolis in 1969. His mom worked as a secretary downtown, and his dad threw pots in the garage. In the afternoons, they would decorate and finish the day’s pots and talk about turning their art into a real business. Three years later, they moved out of the garage and into a studio space in St. Paul. These days Deneen Pottery employs 85 people who can make 14,000 mugs a week in their solar-powered, 16,000-square-foot facility. Running a family business that’s focused on craft and customization hasn’t always been easy. Niles has been working in the business since 2005, and I asked him how the business has evolved, and what’s next for their crew. 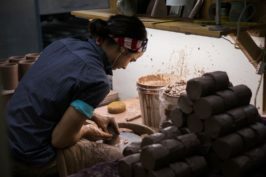 Like most businesses Deneen Pottery has gone through seasons of strong sales and lean times when it has been tough to make ends meet. 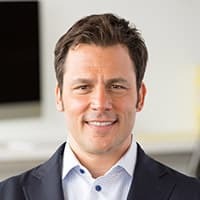 When Niles joined the business 13 years ago, he saw an opportunity to fill the role of marketing and outbound sales, focusing more on fulfilling customers’ needs and finding new kinds of customers. I have a kitchen cabinet full of coffee mugs I rarely use. They are a commodity. The Deneen Pottery mugs are a work of art and the business is thriving and growing, with its handmade products that include long lead times. Do they ever fear customers will abandon ship and order from Amazon instead? I asked Niles. “Our mugs have a soul. Every mug starts as a piece of clay that’s hand-thrown on a potter’s wheel. Because every mug is made entirely by hand, no two are exactly the same.” He acknowledges that it can be hard to communicate that quality through online photos, so one of the company’s best sales strategies is giving mugs away. Nearly 50 years after his parents started making pottery together, Niles sees a clear and promising future for the company. Instead of chasing more growth, in the next few years the company will test out new product lines (his father, now almost 70, has his eye on making dinnerware) and continuing to deliver high-quality products to the customers around the world who have come to expect only the best. Count me in and stay tuned for the next edition in our signature coffee mug collection!